Home > What is Collagen? 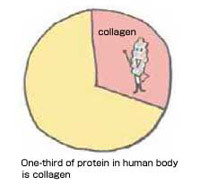 Collagen is a group of proteins that connects and supports other bodily tissues, such as skin, bone, blood vessels, tendons, muscles, and cartilage. It also supports internal organs and is even present in teeth. Collagen makes up 30% of the 100,000 types of proteins that exist in the human body. 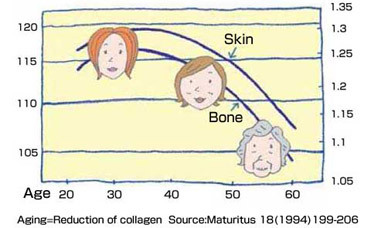 This graph was extracted from international studies… The graph shows the amount of skin and bone, and skin changes among women between the ages of 20 and 69. This evidence proves that the signs of aging are present due to the lack of collagen. The synthesis of collagen is active until the early 20’s; however, begins to decline around the age of 25. With recent advances in medical technology, R & D has grown rapidly, not only in curing diseases, but also in ways to stay feeling and looking young. This has been defined as “Anti-Aging”, which is now a common term that is widely accepted and used. The easiest and most definitive way of having these anti-aging effects is to take collagen as a dietary supplement.